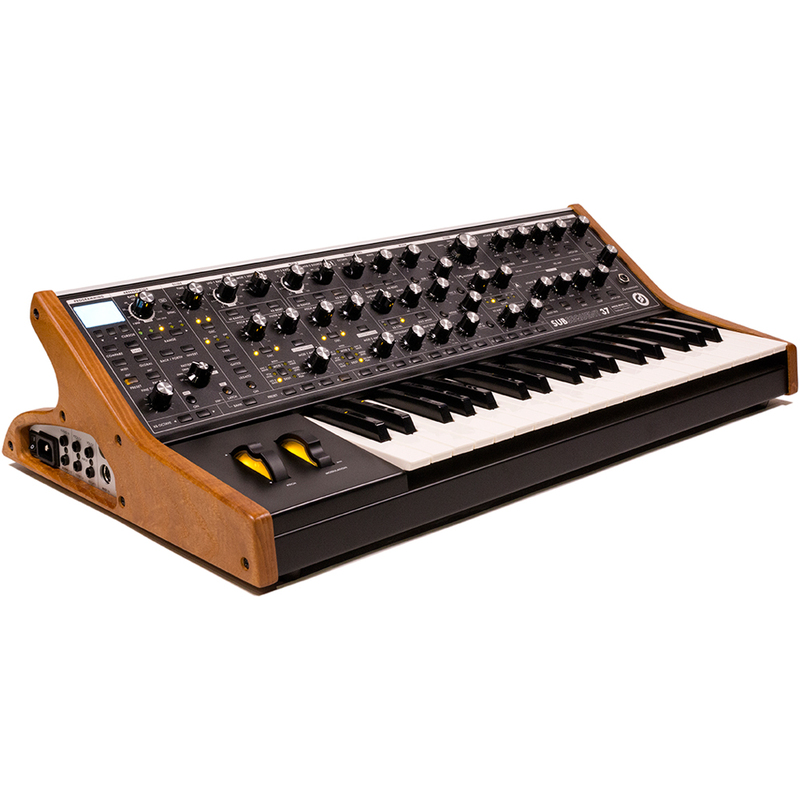 The Subsequent 37 is a (2-note) paraphonic analog synthesizer that builds upon the award-winning design of the ultra-powerful Moog Sub 37 Tribute Edition. Its control panel is home to 40 knobs and 74 switches, placing a vast array of analog sound-design tools and onboard sequencing options immediately at your command. 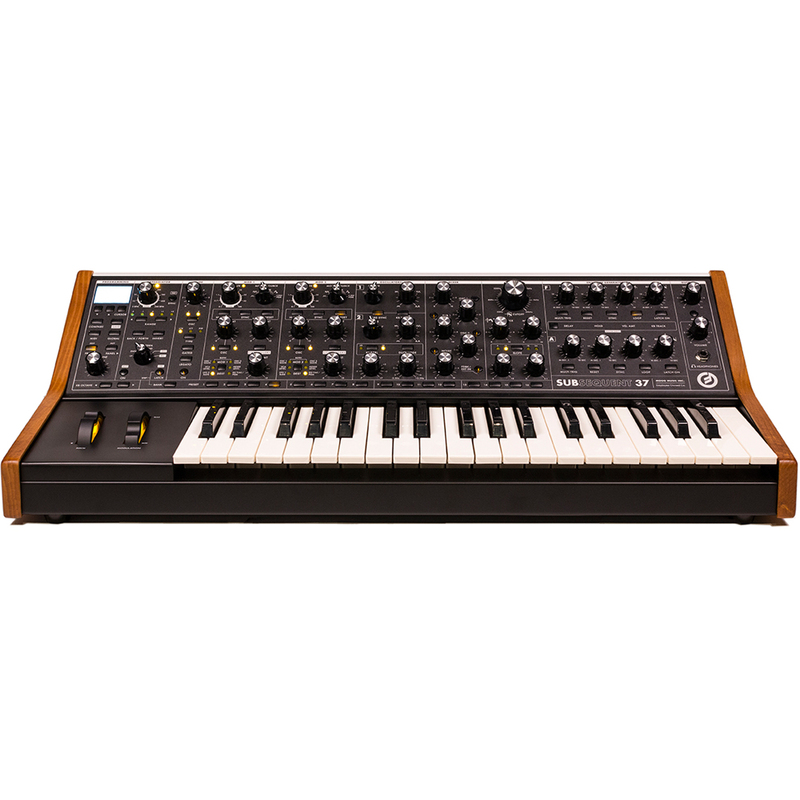 The Subsequent 37 improves upon its source through the implementation of a number of user-requested sonic and functional enhancements. Each enhancement maintains the magic and character of its predecessor while also providing access to new dimensions of sound and improved playability. HIGH-POWER HEADPHONE PORT – Cue up your next sound in the loudest of venues. PROGRAMMABLE SOURCES: Amp Env, Constant ON, Sine LFO, Noise LFO, Osc 1 Pitch, Osc 2 Pitch, Seq Note, Seq Vel, and Seq Mod. PROGRAMMABLE DESTINATIONS: Filter Resonance, Filter Drive, Filter Slope, Filter Env Amount, Filter Keyboard Amount, Osc 1 Level, Sub Osc Level, Osc 2 Level, External In/Feedback Level, Osc 1 On, Sub Osc On, Osc 2 On, Noise On, External In/Feedback On, Arp Rate, Arp Clock Division, Arp Range, Arp Back/Forth, Arp Ends, Arp Invert, Arp Gate Length, Arp Run, Glide Time, Glide OSC Choice, Glide Type, Glide Gate, Glide Legato, Glide On, LFO 1 Clock Division, LFO 1 Range, LFO 1 Sync, LFO 1 Keyboard Reset, LFO 1 Keyboard Track, Mod 1 Pitch Amount, Mod 1 Filter Amount, Mod 1 Programmable Amount, Mod 1 Programmable Destination, LFO 2 Clock Division, LFO 2 Range, LFO 2 Sync, LFO 2 Keyboard Reset, LFO 2 Keyboard Track, Mod 2 Pitch Amount, Mod 2 Filter Amount, Mod 2 Programmable Amount, Mod 2 Programmable Destination, Osc 1 Oct, Osc 2 Sync, Osc 2 Keyboard Reset, Osc 2 Oct, Osc 2 Keyboard Control, Osc 2 DUO Mode, Osc 2 Freq, Osc 2 Beat Freq, Filter Env Attack, Filter Env Decay, Filter Env Sus, Filter Env Release, Filter Env Delay, Filter Env Hold, Filter Env Vel Amount, Filter Keyboard Track, Filter Env Multitriggering, Filter Env Reset, Filter Env Sync, Filter Env Loop, Filter Env Latch, Amp Env Attack, Amp Env Decay, Amp Env Sus, Amp Env Release, Amp Env Delay, Amp Env Hold, Amp Env Vel Amount, Amp Keyboard Track, Amp Env Multitriggering, Amp Env Reset, Amp Env Sync, Amp Env Loop, Amp Env Latch, Output Volume, Bend Up, and Bend Down. Mod 1x Ctrl, Mod 2, Mod 2 x Ctrl, Filter EG, Amp EG, Pitch Wheel, Mod Wheel, Seq Mod, Duo Pitch. GATE DESTINATIONS: KB Gate (is also sequence gate),Ext. Gate, Arp/Seq Clock, Arp/Seq Run/Stop, Arp/Seq Step 1 Trig, Filt EG Trigger, Amp EG Trigger, LFO 1 Rate, LFO 2 Rate.